Download "COMMUNITY COLLEGE OF CITY UNIVERSITY CITY UNIVERSITY OF HONG KONG"
1 COMMUNITY COLLEGE OF CITY UNIVERSITY CITY UNIVERSITY OF HONG KONG Information on a Course offered by Division of Applied Science and Technology Course Title: (English) Java Programming (Chinese) Course Code: AST20205 Credit Units: 3 Level: A2 Medium of Instruction: English Pre-requisites: Nil Pre-cursors: AST21105 Equivalent Courses: Nil Exclusive Courses: Nil Course Duration: One Semester Course Aims: This course aims at providing students with an in-depth understanding of software development using Java programming language. Students will be trained with concepts and techniques in the development of real-world applications that comply with industry standards using a wide range of Java Application Programming Interfaces (APIs). Course Intended Learning Outcomes (CILOs) Upon successful completion of this course, students will be able to: 1. Apply appropriate programming skills and techniques to the development of wide range of applications using Java packages; 2. Identify the differences, strengths and limitations among different Object-Oriented Programming (OOP) languages; 3. Develop cross platform real-world applications with well-known software development tools and Application Programming Interfaces (APIs); 4. Design computer programs that comply with industrial standards and norms; 5. Justify the use of different API packages for different applications and present them verbally. 2 Alignment of the CILOs with the PILOs of ASc in Information Systems Development: Programme Intended Learning Outcomes (PILOs) I. Use a range of tools, programming languages, methodologies, and quantitative skills to undertake information systems development work; II. Apply technical knowledge and skills, and well-proven software models and work responsibly as a team to develop secure, robust, and reliable quality business information systems; III. Practise in an ethical and professional manner, and apply safety and health measures at work; IV. Communicate effectively, both orally and in writing, using English and Chinese in a culturally diversified workplace; V. Examine the major socio-political, cultural and economic issues affecting information systems development in the local, national, regional and international contexts; and VI. Relate the major ideas in arts and humanities, science and technology to the study of Information Technology. CILOs (Please if the CILO(s) is/are aligned with the PILO Keyword Syllabus: (a brief description of the syllabus of the course) 1. Foundation of Java Brief history of Java; Cross-platform program development; Programming environment; Migrating from C++ to Java: Primitive and non-primitive data types, arrays, basic I/O, classes and objects, access modifiers, constructors and object initialization, inheritance, method overriding and polymorphism, dynamic binding, and abstract classes; Static classes; Inner classes. 2. Packages and Interfaces Defining packages; Class path; Package naming; Accessibility of packages; Importing packages; Defining interfaces; Implementing interfaces. 3 3. Exception Handling The use of exception handling; Handling of exception using try-catch-finally; Multiple catch blocks; Exception hierarchy; Checked and unchecked exceptions; Throwing and re-throwing exception; Creating exception subclasses. 4. Advanced I/O File and streams; Input/Output class hierarchy; Object serialization and deserialization; Filter and pipe streams. 5. GUI Programming AWT and Swing Graphical User Interface (GUI) components; Layout and component managers; Action and event handling (event class, event types and listener, action event, window event, mouse event, key event); Applet. 6. Multithreading Programming Fundamental concepts; Thread states and life cycle; Thread creations and executions; Thread priorities and synchronization. 7. 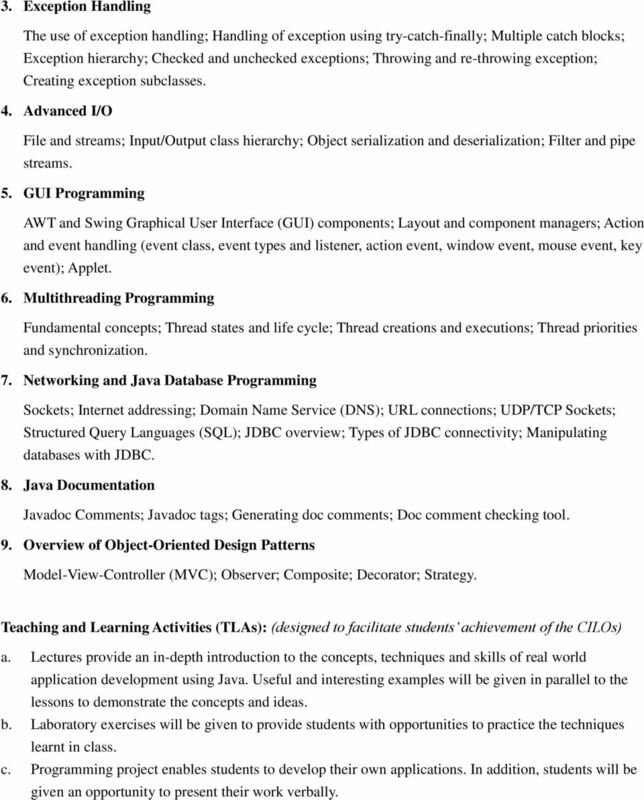 Networking and Java Database Programming Sockets; Internet addressing; Domain Name Service (DNS); URL connections; UDP/TCP Sockets; Structured Query Languages (SQL); JDBC overview; Types of JDBC connectivity; Manipulating databases with JDBC. 8. Java Documentation Javadoc Comments; Javadoc tags; Generating doc comments; Doc comment checking tool. 9. Overview of Object-Oriented Design Patterns Model-View-Controller (MVC); Observer; Composite; Decorator; Strategy. 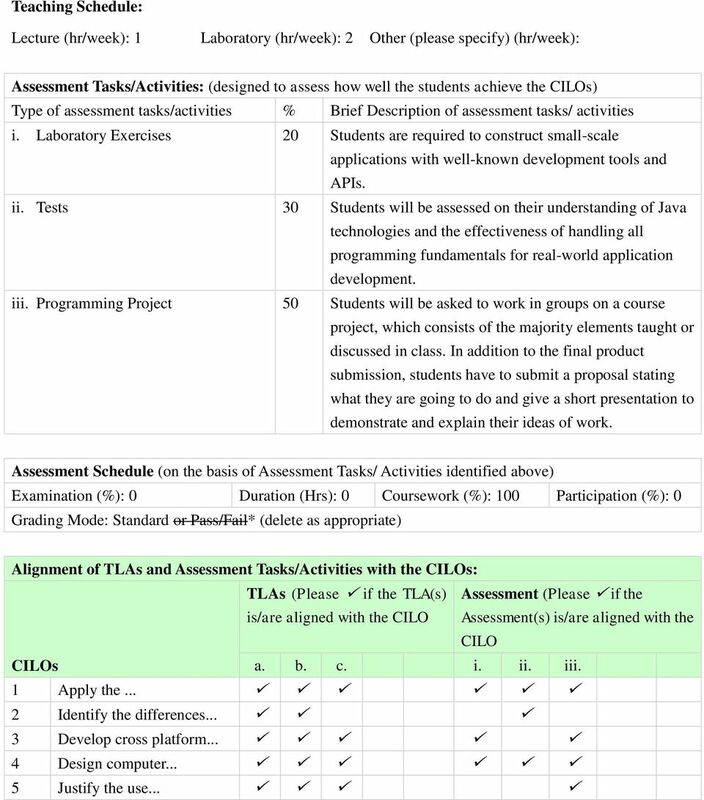 Teaching and Learning Activities (TLAs): (designed to facilitate students achievement of the CILOs) a. Lectures provide an in-depth introduction to the concepts, techniques and skills of real world application development using Java. Useful and interesting examples will be given in parallel to the lessons to demonstrate the concepts and ideas. b. Laboratory exercises will be given to provide students with opportunities to practice the techniques learnt in class. c. Programming project enables students to develop their own applications. In addition, students will be given an opportunity to present their work verbally. 5 Indicative Readings Java How to Program (Early Objects), 10 th Edition, Paul Deitel, Harvey Deitel, Prentice Hall, Core Java, Volume I - Fundamentals, 9 th Edition, Cay S. Horstmann, Gary Cornell, Prentice Hall, Core Java, Volume II - Advanced Features, 9 th Edition, Cay S. Horstmann, Gary Cornell, Prentice Hall, 2013. Form 2B City University of Hong Kong Information on a Course offered by Department of Information Systems with effect from Semester A in 2008 / 2009 Part I Course Title: Course Code: Course Duration: No. 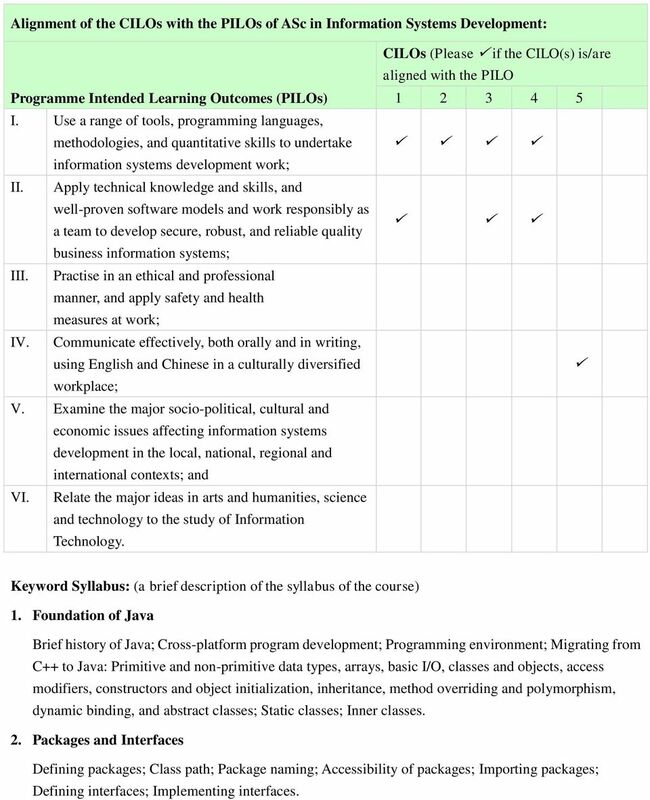 Form 2B City University of Hong Kong Information on a Course offered by Department of Information Systems with effect from Semester A in 2009 /2010 Part I Course Title: Course Code: Course Duration: No. COURSE SYLLABUS. J2EE Technologies. Industrial Training (4 MONTHS) PH: 0481 2411122, 09495112288. Vazhoor Road Changanacherry-01. City University of Hong Kong. 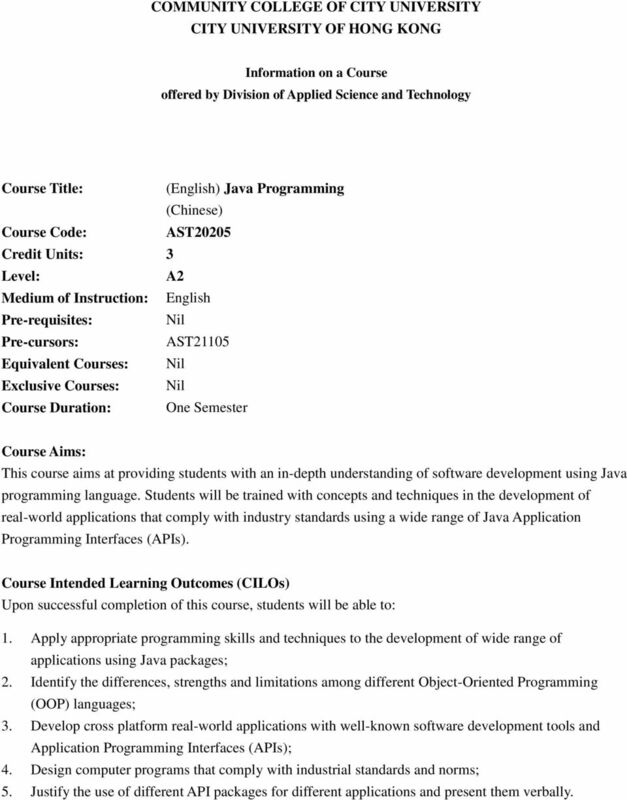 Information on a Course offered by Department of Information Systems with effect from Semester A in 2014 / 2015.